In college, I found there were scholars who took demons and demonology seriously. This was all much more to my liking even though these scholars left out all of the flash and glamour and the spitting of pea soup utilized by Hollywood. Scholars tend to focus on texts, and that was essentially what I was after--textual expositions on demonology. Cool weather has finally arrived here in North Carolina, and it has been a long time coming. Fall and winter are my favorite writing months. Nothing I love more than curling up under a blanket to write a tale while the chill winds blow. When I first envisioned the Katharoi series, I wanted to write one novel for each season. I began with autumn because it is my favorite. So in celebration of the very first autumn that my debut novel is floating around in the world, I thought I would do a giveaway on Goodreads. 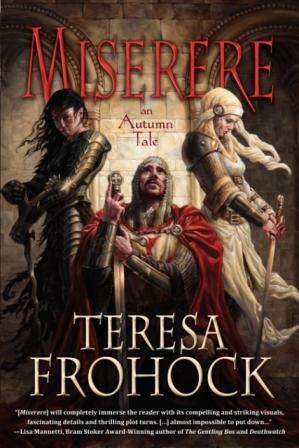 From now through October 31, 2011, I am giving away two autographed copies of Miserere: An Autumn Tale, and I might just throw in some swag to the lucky winners. Today I'm hanging out with John over at Dreaming in Books. I loved John's question, because he asked me about one of my favorite topics: research. I did a lot of research regarding heaven and hell while I wrote MISERERE. Of course, I’ve been fascinated with hell ever since I was a child. I was raised as a Southern Baptist, and when I was young, I thought heaven sounded a bit dull. Hell, on the other hand, seemed like a really happening place.